Continental drift is the movement of the Earth's continents relative to each other. The hypothesis that continents 'drift' was first put forward by Abraham Ortelius in 1596 and was fully developed by Alfred Wegener in 1912 when he noticed that the shapes of continents on either side of the Atlantic Ocean seem to fit together (for example, Africa and South America). Francis Bacon, Antonio Snider-Pellegrini, Benjamin Franklin, and others had noted much the same thing earlier. However, it was not until the development of the theory of plate tectonics in the 1960s, that a sufficient geological explanation of that movement was found. The similarity of southern continent fossil faunas and some geological formations had led a relatively small number of Southern hemisphere geologists to conjecture as early as 1900 that all the continents had once been joined into a supercontinent known as Pangaea. The concept was initially ridiculed by most geologists, who felt that an explanation of how a continent drifted was a prerequisite and that the lack of one made the idea of drifting continents wholly unreasonable. The theory received support through the controversial years from South African geologist Alexander Du Toit as well as from Arthur Holmes. The idea of continental drift did not become widely accepted as theory until the 1950s in Europe. By the 1960s, geological research conducted by Robert Dietz, Bruce Heezen, and Harry Hess along with a rekindling of the theory including a mechanism by J. Tuzo Wilson led to acceptance among North American geologists. The hypothesis of continental drift became part of the larger theory of plate tectonics. This article deals mainly with the historical development of the continental drift hypothesis before 1950. Evidence for the movement of continents on tectonic plates is now extensive. Similar plant and animal fossils are found around the shores of different continents, suggesting that they were once joined. The fossils of Mesosaurus, a freshwater reptile rather like a small crocodile, found both in Brazil and South Africa, are one example; another is the discovery of fossils of the land reptile Lystrosaurus in rocks of the same age at locations in Africa, India, and Antarctica. There is also living evidence the same animals being found on two continents. Some earthworm families (e.g. Ocnerodrilidae, Acanthodrilidae, Octochaetidae) are found in South America and Africa, for instance. The complementary arrangement of the facing sides of South America and Africa is obvious, but is a temporary coincidence. In millions of years, slab pull and ridge-push, and other forces of tectonophysics, will further separate and rotate those two continents. It was this temporary feature which inspired Wegener to study what he defined as continental drift, although he did not live to see his hypothesis generally accepted. The evolution of tectonophysics is closely linked to the history of the continental drift and plate tectonics hypotheses. The continental drift hypothesis had many flaws and scarce data. The fixist, the contracting Earth and the expanding Earth concepts had many flaws as well. Wegener had data for assuming that the relative positions of the continents change over time. It was a mistake to state the continents "plowed" through the sea. He was an outsider with a doctorate in astronomy attacking a established theory between geophysicists. The geophysicists were right to state that the Earth is solid, and the mantle is elastic (for seismic waves) and inhomogeneous, and the ocean floor would not allow the movement of the continents. But excluding one alternative, substantiates the opposite alternative: passive continents and an active seafloor spreading and subduction, with accretion belts on the edges of the continents. The velocity of the sliding continents, was allowed in the uncertainty of the fixed continent model and seafloor subduction and upwelling with phase change allows for inhomogeneity. The problem too, was the specialization. A. Holmes and A. Rittmann saw it right (Rittmann 1939). Only an outsider can have the overview, only an outsider sees the forest, not only the trees (Hellman 1998b, p. 145). But A. Wegener did not have the specialization to correctly weight the quality of the geophysical data and the paleontologic data, and its conclusions. Wegener's main interest was meteorology, and he wanted to join the Denmark-Greenland expedition scheduled for mid 1912. So he hurried up to present his Continental Drift hypothesis. The Great Rift Valley is a name given in the late 19th century by British explorer John Walter Gregory to the continuous geographic trench, approximately 6,000 kilometres (3,700 mi) in length, that runs from northern Syria in Southwest Asia to central Mozambique in East Africa. The name continues in some usages, although it is today considered geologically imprecise as it combines features that are today regarded as separate, although related, rift and fault systems. Earth's continents may have been born under large mountain ranges like the Andes. New research combining a mysterious missing trace element, a 66-million-year-old rock burped up by an ancient volcano, and a database of all the rock chemistry analyzed by scientists in the past century explains why Earth has continents. A study suggests that where mountains are born, so are continents. A new interactive map lets you travel back in time to view our planet as it appeared millions of years ago. 'Ancient Earth Globe' reveals how the continents have split and reformed while oceans advanced and receded across 600 million years of the planet's history. 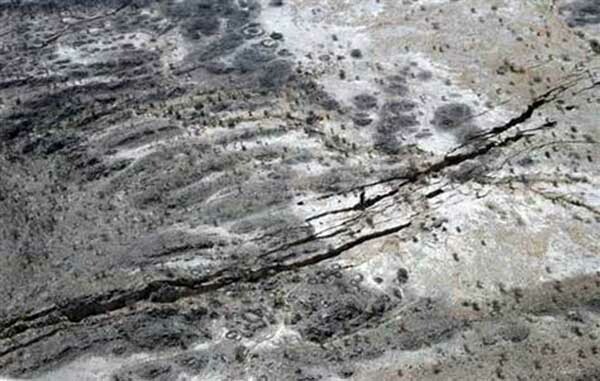 A large crack, stretching several kilometres, made a sudden appearance recently in south-western Kenya. The tear, which continues to grow, caused part of the Nairobi-Narok highway to collapse and was accompanied by seismic activity in the area. The Earth is an ever-changing planet, even though in some respects change might be almost unnoticeable to us. Plate tectonics is a good example of this. 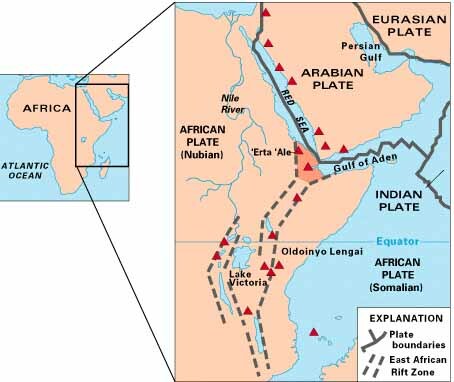 But every now and again something dramatic happens and leads to renewed questions about the African continent splitting in two. The Earth's lithosphere (formed by the crust and the upper part of the mantle) is broken up into a number of tectonic plates. These plates are not static, but move relative to each other at varying speeds, "gliding" over a viscous asthenosphere. Severe weather and seismic activity is causing the continent of Africa to split. Heavy weather in the rift valley of Kenya is increasing an enormous ground crack. People who lived near that opening have been forced to evacuate from the area as it continues to receive rain, floods and tremors. Splitting a continent into two sections is quite common. The climate phenomenon led to the opening of the Atlantic Ocean. Africa and South America were once one landmass, but they were eventually sutured apart by the mid-Atlantic ridge. Geologists investigating the crack in Kenya say the rift valley sits on some of the most unstable ground in Africa. It is projected that the rifting process will take many millions of years as the crust begins to thin and sink and a small seaway begins to intrude the rift zone. The oceanic crust produced by the Earth today is significantly thinner than crust made 170 million years ago during the time of the supercontinent Pangea. The thinning is related to the cooling of Earth's interior prompted by the splitting of the supercontinent Pangaea, which broke up into the continents that we have today. The mantle is the very hot, but mostly solid, layer of rock between the Earth's crust and core. Magma from the mantle forms oceanic crust when it rises from the mantle to the surface at spreading centers and cools into the rock that forms the very bottom of the seafloor. Since about 2.5 billion years ago, the mantle has been cooling - a phenomenon that doesn't influence the climate on the surface of the Earth and has nothing to do with the issue of short-term man-made climate change. About 1.1 billion years ago, what are now El Paso, Texas, and Antarctica appear to have existed side by side, scientists say. The find is part of a decades-long effort to piece together fragments of an ancient supercontinent that existed before Pangaea. "Most people are familiar with Pangaea," said study co-author Staci Loewy, a geochemist at California State University, Bakersfield. "That was a supercontinent that formed 300 million years ago." Pangaea began to break apart about 225 million years ago due to geological processes related to plate tectonics, which eventually spread Earth's landmasses into the continents we see today. The supercontinent's pieces can be reassembled by tracing ancient mountain belts and other geologic patterns - such as the Appalachian Mountains, which are geologically related to mountains of England and Scandinavia. Moses may have received some geological assistance when he parted the Red Sea to let the Israelites through, according to the Bible. In a new study, scientists have determined that a recent tear in Earth's continental crust near the sea is the largest single rip seen since satellite monitoring began. The largest tear in the Earth's crust seen in decades, if not centuries, could carve out a new ocean in Africa, according to satellite data. Geologists say a crack that opened up last year may eventually reach the Red Sea, isolating much of Ethiopia and Eritrea from the rest of Africa. The 60km-long rift was initially sparked by an earthquake in September. Follow-up observations reported in the journal Nature suggest the split is growing at an unprecedented rate. Sahara Desert Was Once Lush and Populated -- The pharaohs of ancient Egypt owed their existence to prehistoric climate change in the eastern Sahara, according to an exhaustive study of archaeological data that bolsters this theory. Starting at about 8500 B.C., researchers say, broad swaths of what are now Egypt, Chad, Libya, and Sudan experienced a "sudden onset of humid conditions." Like pieces in a giant jigsaw puzzle, continents have split, drifted and merged again many times throughout Earth's history, but geologists haven't understood the mechanism behind the moves. A new study now offers evidence that continents sometimes break along preexisting lines of weakness created when small chunks of land attach to a larger continent.